Site: Open and sunny. Light soil, well drained area and full sun. Growing: Set out 12 inches apart. Plant among roses or summer prune to keep tidy. Possible to grow small plants indoors. 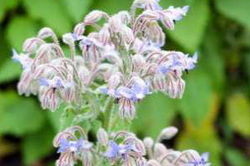 Borage does not like transplanting because of its tap root. Staking is sometimes necessary. Grows to 2 1/2 feet high and 2 feet wide. Harvesting: Pick flowers and leaves. To use the fresh flowers, first remove the thorny back side. Rinse the flowers gently and pat them dry. They hold up well when refrigerated between two pieces of damp toweling. Culinary Uses: Sprinkle flowers in salads and crystallized as a garnish for cake decorations. A colorful and tasty combination is shrimp and avocado, with a lemon vinaigrette and borage flowers. Some people do not like the thistle like hairs on the leaves, but if you are not bothered by them, add the leaves to cold drinks for the cucumber flavor and cooling effect. Chop leaves finely for salads, yogurt, soft cheese, pickles and sandwiches. Cook as spinach or with spinach. Also good added to ravioli stuffing.